The NAMM Show is one of the ultimate musical indulgences this world has to offer. 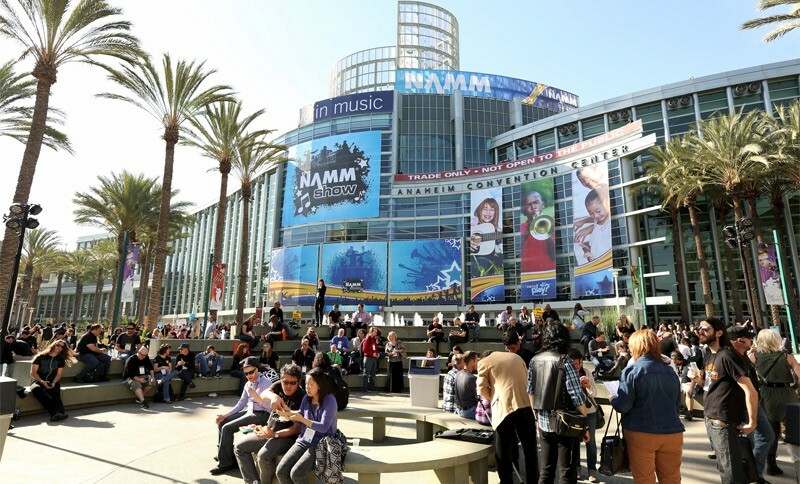 Each year the National Association of Music Merchants (NAMM) puts on two NAMM trade shows – a Summer event in Nashville and a winter event in Anaheim. The winter NAMM Show takes place at the Anaheim Convention Center in late January in sunny Anaheim, CA. The NAMM association is a not-for-profit association that “promotes the pleasures and benefits of making music and strengthens the $17 billion global music product industry.” These NAMM shows are ideal for individuals looking to learn more about the newest innovations and products, technologies, sound/lighting systems, and essentially anything else music production related. The exhibition halls provide a platform for members to experience a wide array of products, gear, and accessories for every kind of buyer and decision-maker The NAMM Show draws buyers from a variety of companies and media outlets from around the world. This presents attendees with the opportunity to build a diverse network of contacts, including: attendees from over 100 countries and territories, decision-makers from a range of global companies and venues, and industry media as well as reporters from global newspapers, TV and radio outlets. According to The NAMM Show’s official website – Attendance at NAMM trade shows is restricted to owners, suppliers, employees, endorsed artists and guests of NAMM member companies. NAMM’s membership is comprised of companies that make, buy and/or sell musical instruments and products. If your company meets this requirement, we invite you to visit our membership page and start the process of becoming a member of NAMM. Once your company has been approved for membership, you may create an account on www.namm.org and use The NAMM Show section to register for housing, booth space, and badges, as well as read about scheduled NAMM Show events. NOTE: Active NAMM members are able to register for free badges for the event. Anaheim is a city that’s most widely known for Disneyland, immediately followed by its massive convention presence. Frequently referenced as the home of Disneyland, Anaheim is the tenth largest city in California. Anaheim has a population of approximately 330,000 people and is part of the Los Angeles-Long Beach-Santa Ana metropolitan area which is home to over 12 million people. Metro Exhibits is extremely familiar with Anaheim and we are proud to offer our exhibition and trade show services anywhere in the city. Some of the most well-known Anaheim expos, trade shows, and conventions include the VidCon, Solar Power International, MD&M West, The NAMM Show, PMA Fresh Summit, The Rental Show, West Coast Franchise Show, and many more. The Anaheim Convention Center is the largest convention center on the west coast and it supports 815,000 sq.ft. of exhibition space and is scheduled for an expansion in 2017 that will increase this exhibition space to over 1 million square feet. Metro Exhibits has been a proud supplier of a wide range of services for exhibitors and companies who participate in THE NAMM SHOW. Contact Metro today to learn more about tradeshow exhibit rentals, custom exhibits and other tradeshow support services in Anaheim, California for THE NAMM SHOW.